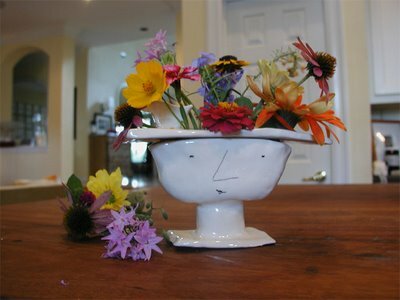 I spotted these quirky ceramic hand thrown vases today on pamela barsky's blog and felt inspired to share simply because they are so unique, adorable, and well - you can actually use them (vs. simply display) by adding fresh fleurs from the garden, kitchen utencils, pens, or whatever else you'd like these vessels to display for you. I love how handmade they look, it's nice to see ceramics that aren't poured into a mold and mass produced by the thousands. It's also refreshing to see clean white with whimsical details - most of the time, whimsy is displayed through color, yet Curlin expresses fun with abstract facial features and odd shapes in simply white. The color is up to you to add with whatever you choose to fill them with. 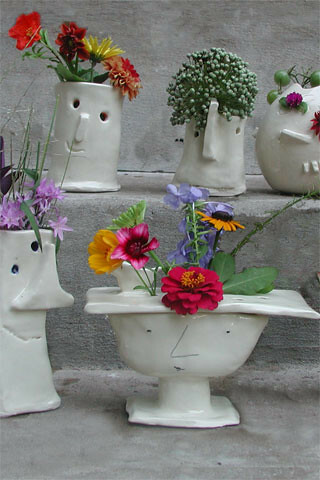 Visit Curlin Reed Sullivan and her brand new vases online. Don't miss her lovely illustrations, available as cards, prints, posters, and journals, too. Curlin is one talented lady! A big thanks to Pamela for blogging her first!